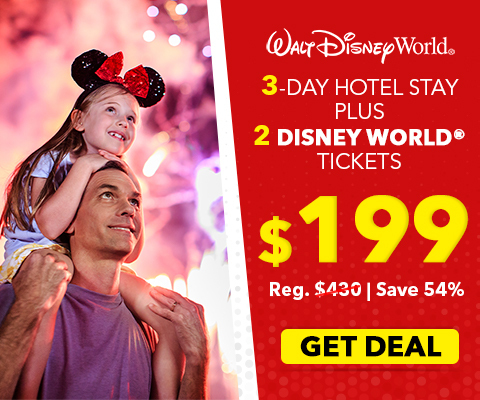 Think you know everything about Walt Disney World Resort and its four world-class theme parks – Disney’s Magic Kingdom Park, Epcot, Disney’s Hollywood Studios and Disney’s Animal Kingdom Theme Park? Think again! 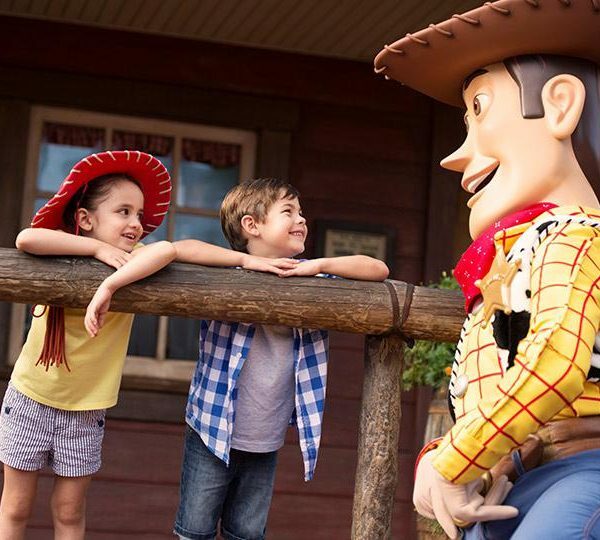 Even the biggest Disney World fanatic will be amused, intrigued or surprised by some of the 50 fascinating Disney World facts listed below . . .
1. 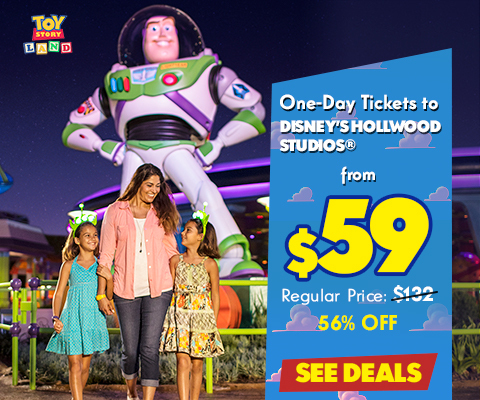 Walt Disney World Resort encompasses 30,500 acres, making it approximately the same size as San Francisco. 2. When Disney’s Magic Kingdom Park first opened its doors on October 1, 1971, adult admission cost $3.50. 3. The opening day crowd at Disney’s Magic Kingdom Park was approximately 10,000 guests. 4. The eight “E ticket” attractions at Disney’s Magic Kingdom Park were Space Mountain, Pirates of the Caribbean, Haunted Mansion, Country Bear Jamboree, Hall of Presidents, Jungle Cruise, It’s a Small World and 20,000 Leagues under the Sea. 5. 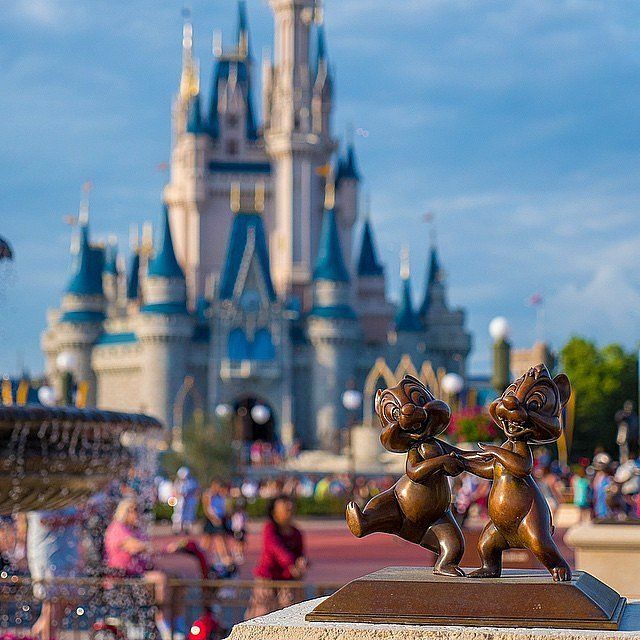 The estimated annual attendance at Disney’s Magic Kingdom Park is 17.5 million, followed by Epcot with 11 million, Disney’s Hollywood Studios with 9.9 million and Disney’s Animal Kingdom with 9.9 million. 6. Cinderella Castle is the tallest structure in Disney’s Magic Kingdom Park at 189 feet, followed by Space Mountain at 183 feet. 7. Both the Carousel of Progress and It’s A Small World made their debut at the 1964-65 New York World’s Fair. 8. The 180-foot-tall Spaceship Earth at the entrance to Epcot weighs approximately 16 million pounds. 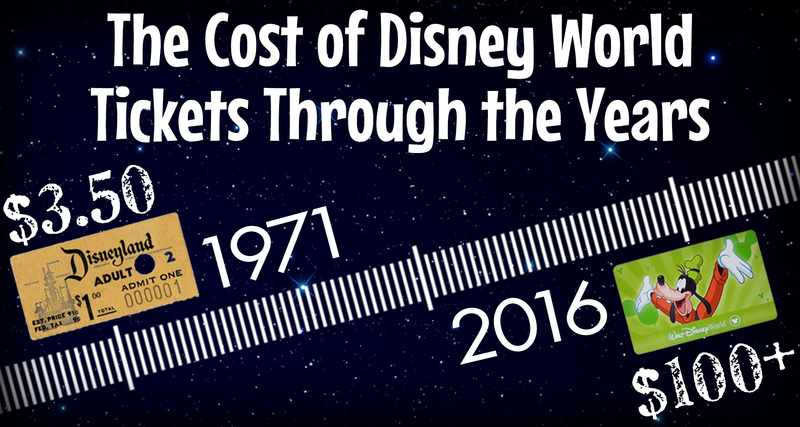 Check out our Disney World ticket timeline video! 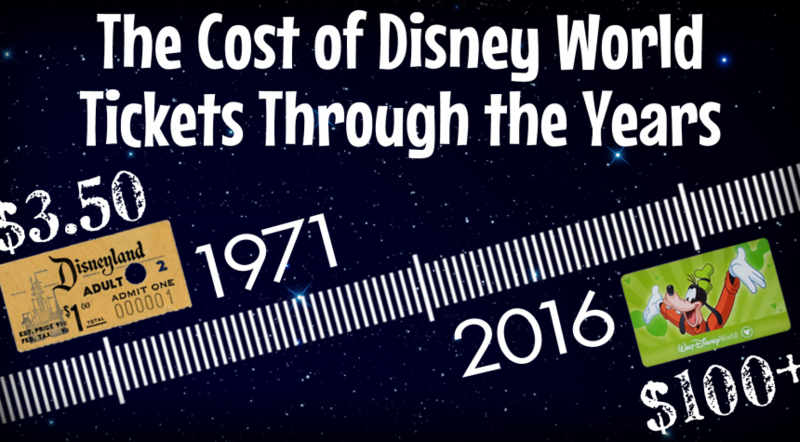 We go through all the Disney ticket changes from when it opened in 1971. Click the image below! 11. In conjunction with the release of Pirates of the Caribbean: Dead Men’s Chest, the Pirates of the Caribbean attraction at Disney’s Magic Kingdom Park was renovated to add several characters from the movie such as Jack Sparrow and Hector Barbossa. 12. The icon of Disney’s Animal Kingdom Theme Park, The Tree of Life, stands 14 stories, features more than 300 animal carvings and is 50 feet wide. 13. Built in 1917, Prince Charming Regal Carrousel in Fantasyland was once located at Olympic Park in Maplewood, New Jersey. 14. The Great Movie Ride at Disney’s Hollywood Studios is housed in a replica of Mann’s Chinese Theater. 15. 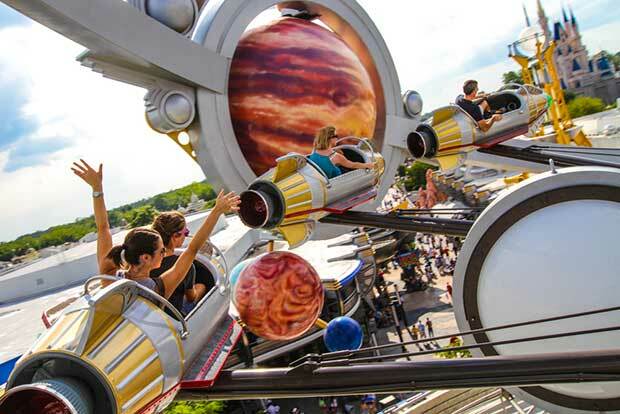 Astro Orbiter first opened in Tomorrowland in 1974 as Star Jets. 16. The Hall of Presidents had its origins as an audio-animatronic exhibition called “Great Moments with Mr. Lincoln,” which premiered at the 1964-65 New York World’s Fair. 17. Originally known as the “Tropical Serenade,” the Tiki Room in Adventureland was once sponsored by Florida Citrus Growers. 18. The 60-foot-tall Swiss Family Treehouse in Adventureland weighs approximately 200 tons and is made of concrete and thousands of polyethylene leaves. 19. Cinderella Castle, the centerpiece of Disney’s Magic Kingdom, features 18 towers and 13 gargoyles. 20. 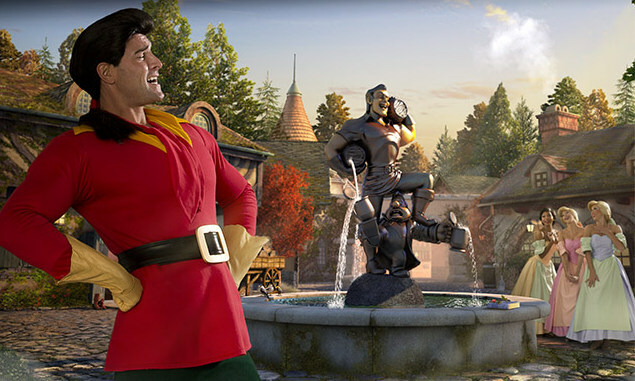 The Many Adventures of Winnie the Pooh at Fantasyland is located on the site of the former Mr. Toad’s Wild Ride. 21. The “Spirits of America” statues in The American Adventure at Epcot represent Adventure, Compassion, Discovery, Freedom, Heritage, Independence, Individualism, Innovation, Knowledge, Pioneering, Self-Reliance and Tomorrow. 22. Towering four stories over DinoLand U.S.A. at Disney’s Animal Kingdom, Dino-Sue is an exact replica of the largest Tyrannosaurus Rex ever discovered. 23. Big Thunder Mountain Railroad in Frontierland features six trains: I.B. Hearty, I.M. Brave, I.M. Fearless, U.B. Bold, U.R. Daring and U.R. Courageous. 24. The Rock ‘n’ Roller Coaster – Starring Aerosmith at Disney’s Hollywood Studios launches you at a speed of 0 to 60 miles per hour in 2.8 seconds. 25. A swinging suspension bridge leads from Tom Sawyer Island to Fort Langhorne, which was named after Samuel Langhorne Clemens (better known as Mark Twain). –— Epcot Flower & Garden Festival 2019 is in full swing! 26. The replica of the Liberty Bell that can be found in the center of Liberty Square was built from the same authentic cast as the original in Philadelphia, Pennsylvania. 27. The exit to Haunted Mansion features crypts with humorous names inscribed such as I.M. Ready, Rustin Peese, Pearl E. Gates, Manny Festation, Dustin T. Dust and Asher T. Ashes. 28. The Walt Disney World Railroad, which serves approximately 1.5-million passengers annually, is an authentic 1928 steam-powered train. 29. The Mission: SPACE thrill ride at Epcot is so authentic that motion sickness bags are available just in case of emergency. 30. A portion of “New Fantasyland” lies in the area that was once known as Mickey’s Toontown Fair, Mickey’s Birthdayland and Mickey’s Starland. 31. Sonny Eclipse, an “intergalactic lounge singer,” performs daily at Cosmic Ray’s Starlight Café in Tomorrowland. 32. In order to rank as a “Galactic Hero” at Buzz Lightyear’s Space Ranger Spin, you must score 900,000 to 999,999 points. 34. Astronauts Scott Carpenter, Gordon Cooper and Jim Irwin were present at the grand opening of Space Mountain in 1975. 35. Stitch’s Great Escape in Tomorrowland lies at the former site of ExtraTERRORestrial Alien Encounter, which closed in 2003. 36. One of the original attractions at Disney’s Magic Kingdom Park, Tomorrowland Speedway was once known as Grand Prix Raceway. 37. Renamed The Seas with Nemo & Friends in 2006, The Living Seas pavilion opened at Epcot in 1986 and was originally sponsored by United Technologies. 38. The Epcot 3-D film “Captain EO” a 3-D film at Epcot was directed by Francis Ford Coppola and stars Michael Jackson and Anjelica Huston. 39. Legendary golfer Jack Nicklaus was the first champion at the Walt Disney World Open Invitational, which made its debut in 1971. 40. The Tomorrowland Transit Authority PeopleMover was originally called the WEDway People Mover (WED standing for Walter Elias Disney). 41. 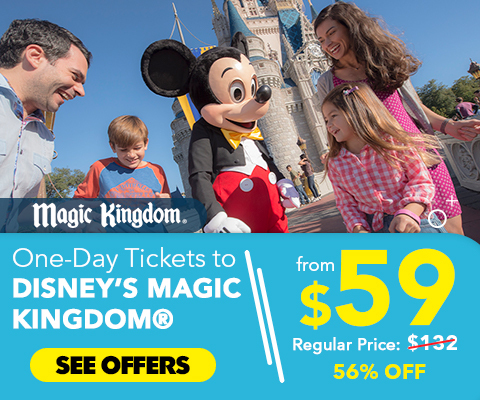 Disney’s Magic Kingdom Park, which encompasses approximately 107 acres, is itself larger than Disneyland, which only covers 80 acres in Anaheim, California. 42. The design of Main Street U.S.A. was loosely based on Walt Disney’s hometown of Marceline, Missouri. 45. Jungle Cruise riverboats include Amazon Annie, Bomokandi Bertha, Congo Connie, Ganges Gertie, Irrawaddy Irma, Kwango Kate, Mongala Millie, Nile Nelly, Orinoco Ida, Rutshuru Ruby, Sankuru Sadie, Senegel Sal, Ucvali Lolly, Volta Val, Wamba Wanda and Zambesi Zelda. 46. Splash Mountain in Adventureland features a five-story, free-fall plunge at a 45-degree angle into a splash pool at a speed of 40 miles per hour. 47. The 8,500-acre Disney Wilderness Preserve, which lies 15 miles South of Disney World, features a Conservation Learning Center and hiking trails. 48. Buzz Lightyear’s Space Ranger Spin is located at the former site of If You Had Wings in Tomorrowland. 49. The three “talking heads” who introduce the Country Bear Jamboree are named Buff, Max and Melvin. 50. 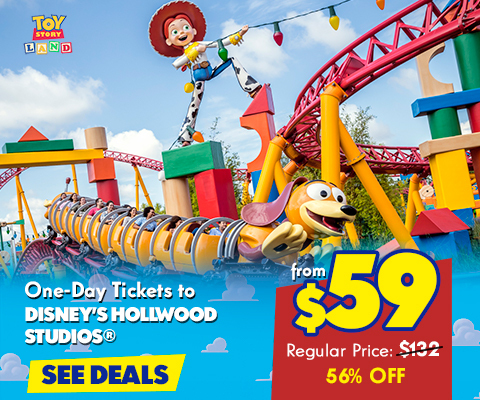 Approximately 48 million people visit Walt Disney World Resort – including Disney’s Magic Kingdom Park, Epcot, Disney’s Hollywood Studios, Disney’s Animal Kingdom Theme Park and Disney Springs Area – annually. 51. 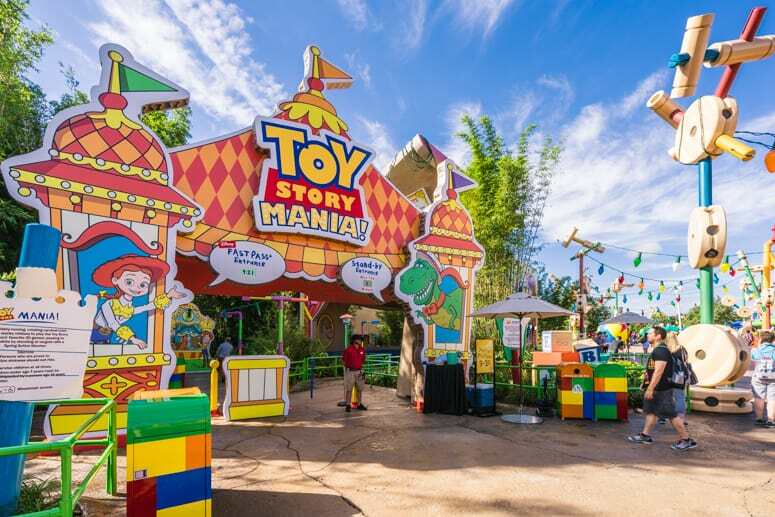 In Toy Story Land, Andy’s footprint is about 25 feet long or the equivalent of a size 240 shoe. Top 5 Hidden Things in Disney World! How can I get a copy of these 50 things about WDW? I’m a grandmother I have been to Disney World with : my husband, then with our children, and now with my grandchildren. It is such a magical place, I will never get to old to go for such a wonderful time. #46 needs a tweak. Splash Mountain is in Frontierland, not Adventureland. Thanks so much for your feed back!